You may remember we reviewed Seven Stories' Christmas Activities last year and thouroughly enjoyed our afternoon. When we were invited back to review this years 'Elves Wanted' the monkeyfooted minis got very excited. The big two still remember last years festivities and we talked a lot on the way about what hapened before and what might happen this year. Elves wanted is a different format to last year as its more of a show where last year was story telling and interactivity. This year sees Santa's best teacher elf, Marte, training us humans to help Santa deliver presents because the elves have all come down with 'elf chicken pox'! Marte is assisted by bumbling elf Arthur who always seems to get it wrong, but tries hard anway. 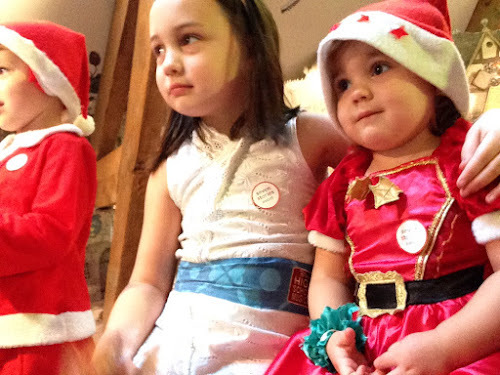 Elf college shows us how to sort the letter, speak reindeer, deliver gifts and much more. Peanut and The Golden Child loved the show and enjoyed being assistants through out the show. 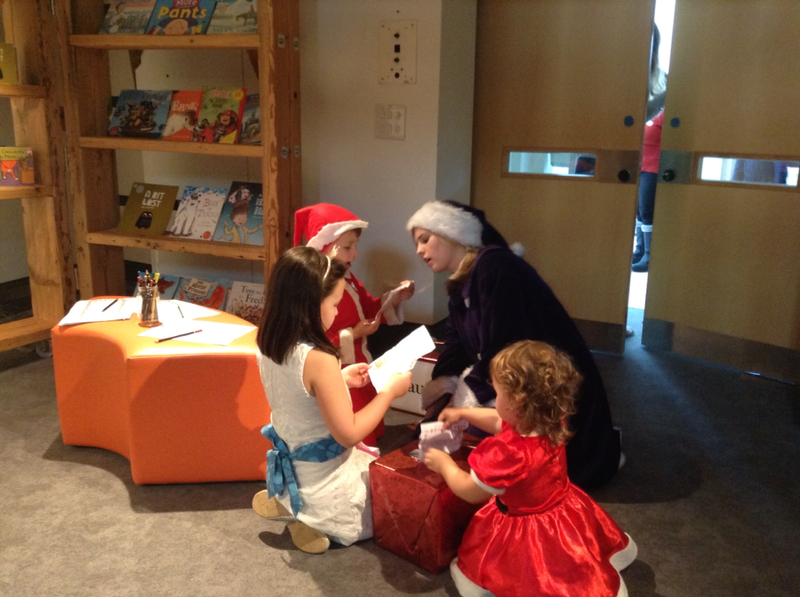 Peanut was chosen to read a letter and The Golden Child helped 'deliver' the gifts. Termite (at 2yrs old) I think was a little too young for this format and ended up restless. 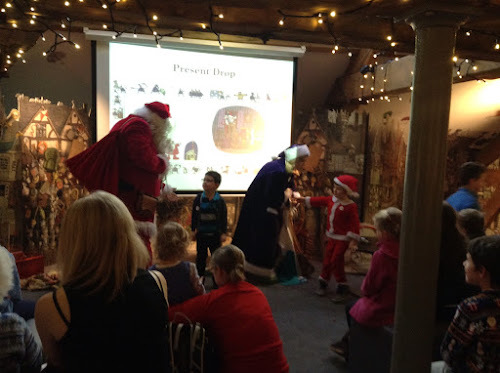 There are plenty of opportunities for assistants and answering questions, and the sleigh riding lesson involves everyone, some giggles for the children and laughs for the adults make this an enjoyable hour. This would be the only area I could suggest some improvement , the queue was quite large so we waited until all the other children had been seen but Santa was being hurried along (as the next show was starting soon) and so the kids managed to miss out on their graduation certificates and only breifly managed a picture before we were asked to clear the room. 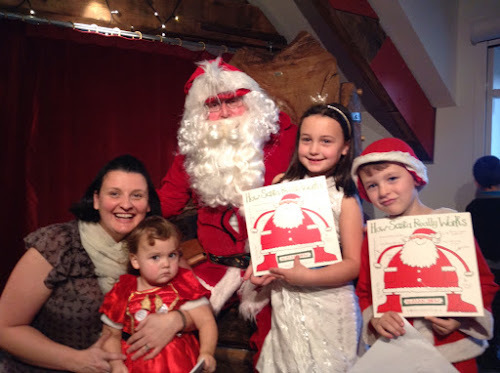 I wonder if it may have been better to take all the childrens names first so santa could call them one at a time, giving all the kids a chance to colour in and chat to the elves instead of queueing? Overall my biggest two enjoyed their experience and the book is lovely and has been read many times this week with much joy, I think this format may be most suitable for children age 3 and over and at £8 per child (for the event only) the day works out quite expensive for our family, but is on par with some of the smaller Christmas Shows or events that we see through the season. The price tag is reasonable considering the quality of book that you get but it would be nice to get entry to the rest of the attraction included or even discounted when booking for this. 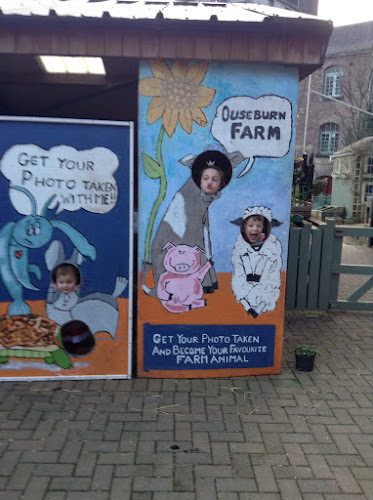 We combined our trip with a visit to Ouseburn Farm to see the animals, wander the garden and enjoy some Christmas treats in the cafe to make the most of our time in Ouseburn Valley. We always combine a trip to Seven Stories with the farm too! Hopefully next year it won't be so rushed. Peanut's face is adorable!